FTC disclaimer: This post contains Affiliate Links. I received a copy of the book for free from the publisher in exchange for a fair and honest review. A quick scroll through my Facebook feed shows numbers of smiling children. However, there's quite a few who don't look like their parents. Many of my friends have adopted, both from the United States and overseas. I've celebrated on this side of the world when they would post that papers were signed and they were now the proud parents of a child they had prayed for, raised money to bring home, and most importantly loved before the child even knew the parents existed. 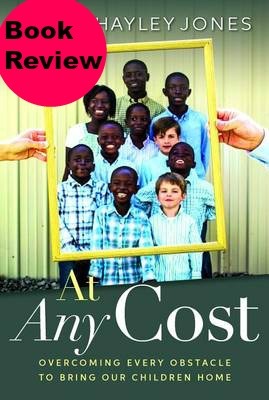 When I was offered the opportunity to review At Any Cost: Overcoming Every Obstacle to Bring Our Children Home, I was excited to read it. Out of my circle of friends, I have only known of a couple to adopt more than one child at once. A friend adopted two brothers from Africa, and other friends adopted two unrelated children in one trip from Asia. But the Jones family had a lot loftier goals -- they wanted to adopt a sibling group of eight from Sierra Leone. Before the Ebola outbreak, this country wasn't on most people's radars. However, a friend of mine has done mission work in that country, and I am well aware it is one of the poorest countries in the world, so the fact that I know someone who has been there multiple times, that made me even more interested in this book. I think it might be easy to pick up this book and point fingers. Why EIGHT children? Was it really needed for Hayley to be overseas that much? How can they afford it? But I have also learned that you shouldn't judge anyone. This family did what they felt was best for all their children -- their biological ones and the eight they adopted from Africa. This book doesn't sugar coat the adoption process. It talks freely of the problems they had -- from holds on adoptions in Sierra Leone, to the cost of flights (nearly $2,000 was the cheapest!). Even the fact the children had to go on a ferry was a concern. Describing the children's life in Africa is a huge contrast to our lives in the United States. From how they hunt for food to relationships, the culture is much different. I highly recommend this book for anyone. If you are thinking about adopting, it will give you an idea of some of the problems -- and joys you will encounter. If you have friends who are adopting, it will give you a bit more of an idea what they are going through and may give you ideas on things you can do to help and encourage them.